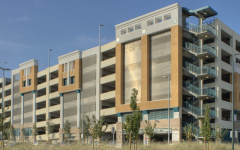 The Dublin/Pleasanton Bay Area Rapid Transit Station (BART) parking structure, a seven-level, 1,500-space garage, welcomes commuters as it sits right off of the I-580 Freeway in Northern California. 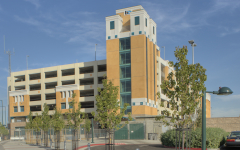 The architectural character of this half-million square foot parking structure is its sturdy, prominent and bold gesture, featuring the building mass as part of the design rather than concealing it. 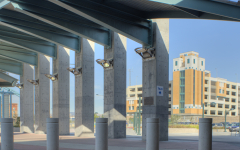 Utility infrastructures were considered for future retail provisions adjacent to the garage and a future horizontal expansion of the structure to provide an additional 700 spaces when needed. With the build-out of adjacent properties, the pedestrian linkage between the garage and the BART station will be an important component to the success of the transit village.